And with over 144 billion emails sent each and every day, it’s never been more challenging to stand apart from the rest. So how do you make sure that your clients emails are the ones that people actually look forward to receiving? A buyer persona really is an important part of your strategy because it will bring clarity to your campaign. If you aren’t sure, a buyer persona is a representation of who your ideal customer is, based on market research from your existing customers. In your case, it’ll be your clients customers. When you come to create them, you’ll need to consider customer demographics, goals, what motivates them to buy, and personality traits. The more detailed you are the better, as this will help you effectively target the right audience. Top tip: Hubspot offer a free template for you to create buyer personas with plenty of tips to get the best out of your market research. When it comes to email marketing, a one-size-fits-all approach simply doesn’t work. If you aren’t segmenting your clients database then you won’t see half as many conversions as you should. The number one rule of any campaign is that it has to be targeted. So once you’ve got your buyer persona ready, you need to think about where that person is in their customer journey. These are the people who are interested in what you have to say, but they aren’t committed to buying. Your job is to keep them engaged and send them content that will help push them towards the sale. This is the point to focus on product offers and promotions to help people convert. 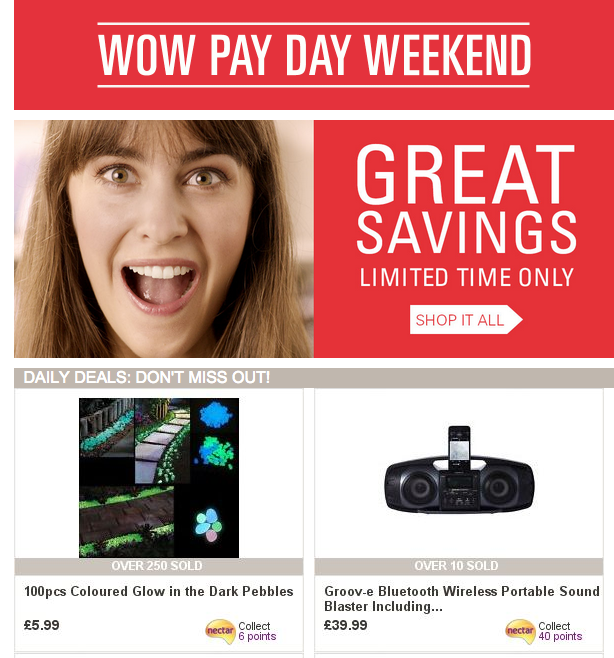 For example, this email from eBay is heavily focused on savings and daily deals, plus it’s targeted to hit people who’ve just been paid. Your customers should be treated differently to your prospects because they’ve already bought something from you, so now is the time to keep nurturing in order to build a long-lasting relationship. Here is where you should be sending exclusive promotions, loyalty rewards and useful content that the customer can takeaway and learn from. 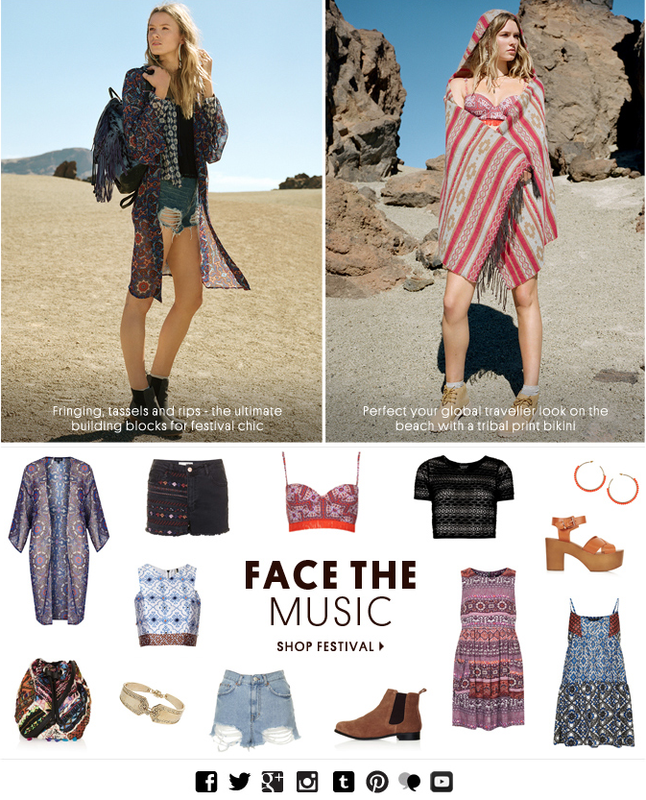 This email campaign from Topshop is the perfect example. It doesn’t focus on selling, but offers style advice on what the customer should be wearing for summer. I’m sure you know the pain of having loads of subscribers, but half of them never interact with your emails? Don’t worry, all is not lost. The best course of action is to plan a drip-series campaign and hit them with emails that will entice them back. You need to re-kindle that relationship by sending tempting offers and promotions, based on their shopping history, in order to convince them to come back to you. You should put this strategy in place when a customer has been missing for at least 6 months. Another common problem that needs tackling is people who abandon their baskets. There could be a number of reasons why they do this such as high shipping costs, but you shouldn’t ignore it. 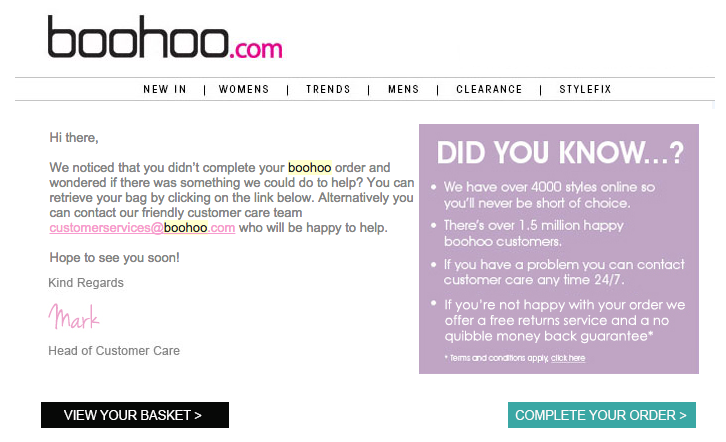 Check out this Boohoo email for the perfect example of what you should do in this instance. The email entices the customer to go back and continue with their order, tells them that there are other options and offers customer support if needed. When I say a personalised experience I don’t just mean include the customer name in each email. You need to really get to know the customer in order to effectively capture their interests. What did they buy from you last? Is there something currently in stock that would capture their interest? The more consideration you put into getting to know customers, the more that customer is likely to appreciate the email and come back for more. Amazon are known for being really effective when providing a targeted, personalised service. 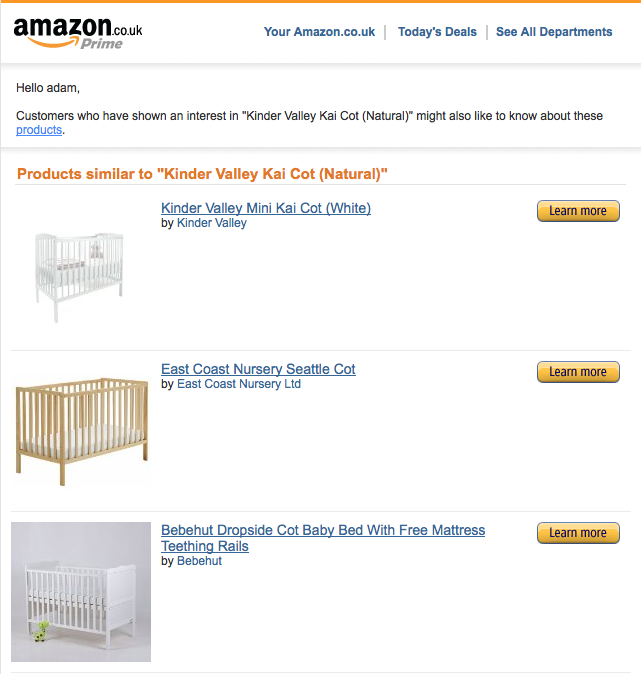 As you can see below, this customer has been looking for baby products so Amazon fired out an email with recommendations of similar products, to further entice the customer. In the world of email marketing, timing is everything. There has been plenty of theories as to when the best time is, with many pushing towards ‘blue monday’ as a day for people to prefer to read emails than focus on work. Interestingly, this study from Experian states that the best days to send out emails would be at the weekend because the competition is low, so your messages are more likely to stand out. The truth is, it really depends on who you are targeting as to what time is best. My advice is to measure your email success and monitor metrics. This will help you find out when the customers are most engaged and you can keep this data in mind as you move forward. The takeaway here is that you need to focus on who you are targeting, in order to build a successful campaign. Make sure you keep communicating with your clients so that you really get to know who their customers are! Did you like this post? Check out 5 reasons why your email marketing strategy is failing.